The directions were confusing but I managed to create a usable pincushion that vaguely resembles a chicken. Learned much from putting the first one together and will hope to have an improved version soon. The husband brought me a bag of sawdust and wood shavings from his woodshopwhich I used to stuff the chicken. Definitely messier than fiberfill but very malleable and free. Currently working on another felt one with embroidery. 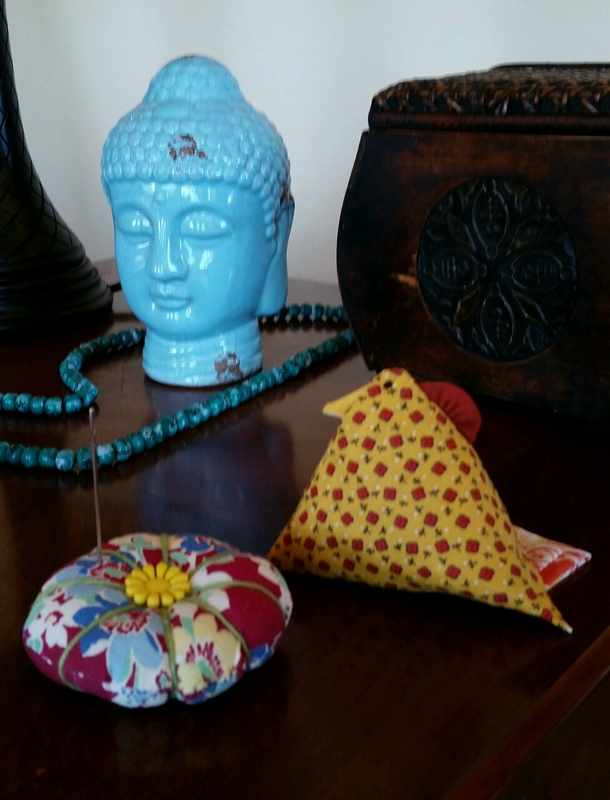 Temperature was 10 * F this a.m. so better to be inside making pincushions as there's not much going on outside. When I brought the succulents in for the winter, a tree frog came in with them. during the warm spell he came awake and sang to me when I took a bath. Then silence. He or she was back today and he serenaded me again. Still have not seen him even though I've looked. The little frog sounds delightful! He's probably thanking your for the warm vacation! Congrats on your continued success with the pincushions! It does sort of look like a chicken!